I have now attempted to write this review of director Amma Asante's new film, A UNITED KINGDOM, four times. Which is weird because it's not a bad film; it just doesn't leave an impression. So coming up with what to write about it has turned into a task. Beginning with Belle in 2013, Asante has explored the politicization of interracial relationships throughout history, across cultures and the world in a way that is personal, urgent, and impactful. But with A UNITED KINGDOM, it feels, distant, cold, and disconnected. For what it's worth, the true life story of the marriage between Prince Seretse Khama of Botswana and Ruth Williams from London, whose romance sparked political turmoil (and his ultimate exile from his own country), is one worth exploring and sharing. Is it worth a movie? Perhaps not. But it does deserve to be known. 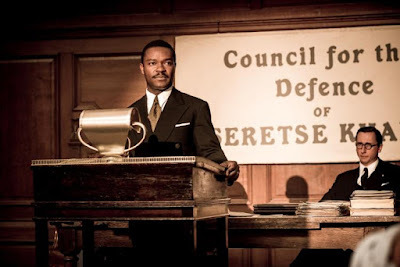 Depicted through two solid performances by David Oyelowo (Seretse) and Rosamund Pike (Ruth), the story of A UNITED KINGDOM spans several years portraying multiple efforts by its protagonists to maintain a relationship amid public outcry accusing Seretse (destined to become Botswana's first president) of betraying his country to be in the arms of a white woman considered to be the enemy. Set in the 1940s in the Southern Africa country, the film follows the couple even as they're forced to be separated for the entire duration of Ruth's pregnancy. While apart, Ruth works to gain the respect of her fellow citizens as an outsider, while an exiled Seretse, viewed by his political counterparts as the insubordinate black man with too much confidence, fights to gain reentry into his country. Throughout it all, their love endures. Asante's flair for romance once again serves a critical role in this film, using warm colors in an attempt to retain the intimacy of the couple (an unsuccessful one, as you always feel like you are sharing their personal moments with their varied, persistent obstacles around them). The story itself (and Guy Hibbert's screenplay) is far too broad and slow-paced -- ranging from gigantic political assemblies, to opposing two-person scenes in stark colored offices, to fleeting romantic rendezvous between the couple. The way the narrative is structured here makes it look like their romance relies almost strictly on the challenges it faces, and not on the actual relationship. That's mostly because we don't get to spend enough time with Seretse and Ruth as a couple. We get a pretty good sense of who they are individually, as they're each faced with their own challenges in separate provinces, but then it makes you wonder what the actual objective of the film is: the political landscape, their romance, Ruth immersing herself in a culture of which she's not a native, or Seretse's struggle to prove himself personally and professionally? The best scene in the film is toward the end, after the battle has been won and the couple is sitting side by side clutching cool drinks in garden chairs across their political opponent, who's just learned he's lost. The smugness, the mutual connection, the perfect lighting of the scene (directly beneath a high sun) and the chemistry between the two leads -- knowing that they have come full circle -- is palpable, and seems to finally relay something the film had been struggling to say throughout its arduous two-hour run time. Asante still deserves credit for bringing stories like this to the big screen, dodging what is likely one Hollywood executive after another determined to box her in as "a one-note black woman director." I love that she has found a particular narrative that means something to her, at which she continues to scratch away -- something many seasoned filmmakers before her have made lots of money not even attempting to accomplish. But still, A UNITED KINGDOM is a disappointing effort from a promising director. A UNITED KINGDOM opens in theaters today.